A look at the changing relationship between RIS, PACS, and EMR. To RIS/EMR or not to RIS/EMR? That's a question that more and more people are asking these days. Increasingly, the answer seems to be yes. There are many reasons to adopt a RIS/EMR, but the biggest driver of the movement is Epic's Radiant RIS. Epic offers Radiant as a component of its EMR. For health care organizations that already use Epic's EMR, the lure of Radiant can be hard to resist. "For a CIO considering the idea of integrating yet another system, as opposed to having the integration literally fall out of the box, [the case for Radiant] is persuasive. And, more and more, it's CIOs who are picking radiology information systems," says R. L. "Skip" Kennedy, MSc, CIIP, technical director of imaging informatics for Kaiser Permanente medical centers in northern California. "Regardless of what your feelings are about PACS/RIS vs EMR/RIS vs standalone RIS, the gravitational well of the EMR/RIS is pulling everybody to it." But is that the best way to achieve interoperability and optimize workflow? Well, it depends. David Avrin, MD, PhD, a professor of clinical radiology and the vice chair for radiology informatics at the University of California, San Francisco (UCSF) School of Medicine, says radiology departments, until recently, didn't have enough confidence in the domain knowledge of EMR vendors about the ins and outs of radiology workflow to trust a RIS component of an EMR. That's one of the reasons that UCSF did considerable research before agreeing to adopt Radiant. So far, Avrin's been impressed with Radiant's capabilities. He says a significant advantage of the RIS/EMR model is that it makes clinical information much more accessible. When a radiologist logs on to the system, Epic recognizes the user and opens the EMR. When the radiologist uses a worklist of the day's cases and opens a case, a synopsis of the patient's record automatically opens, within one second. As soon as one case is signed off, the next one opens. One click opens the full EMR, allowing access to progress notes or other information in the patient's chart. An additional module, Cadence, allows users to see all of the scheduling, including which patients are due for follow-up appointments at their clinician's office, with scheduled, associated same-day imaging. Technologists can get their worklists loaded directly to the scanners. Also, Radiant runs within the EMR in the background, rather than opening as a separate window, making the user experience more seamless. The switch from UCSF's old system, a descendent of DECrad, was well planned and smooth, according to Avrin. Once the preparation was complete, the cutover took three hours to be functional, with some remaining issues that were worked out. The Hospital of the University of Pennsylvania is currently implementing Radiant as well. It has been preparing for four years and expects to go live in spring 2015. Tessa S. Cook, MD, PhD, an assistant professor of radiology and the chief of 3D and advanced imaging at the Hospital of the University of Pennsylvania, is on the transition committee and is one of the superusers from various areas of the health system who will be available to assist typical users. Although the transition has been long in coming, she believes the change is worthwhile and will improve patient care. Cook says Radiant will allow new functionality, such as the ability to customize worklists that draw from different services, but the committee also wants to ensure that current functionality, such as the ability to protocol studies in the RIS, remains available. So far, the focus has been more about accessing data—for example, reports—in a way that users are accustomed to than it has been about moving images into the EMR. Availability of images is still high on the list, however. "The availability of imaging is a big issue, from a meaningful use perspective as well as from a customer service perspective," Cook says. "We want to make sure our referring providers will still be able to see images when they want to and be able to interact with the system in a way that helps them to take care of their patients effectively as well." When it comes to allowing referrers to interact with the system, PACS-driven workflow can be more of a challenge. Paul J. Chang, MD, a professor of radiology and the vice chair of radiology informatics at the University of Chicago Medical Center, says part of the problem is that PACS are efficient for the reading room, but not for what happens outside the reading room. Integrating them with an EMR and optimizing enterprise workflow requires a certain level of expertise. "PACS systems, by and large, unless you know how to integrate them with other systems, don't know what's going on outside of what the PACS does and outside of the reading room, whereas, the RIS/EMR, if done properly, allows you to get that information. You can see who's been scheduled, what's been ordered, whether the patient has shown up, etc," Chang says. "It doesn't mean you can't do it if you're PACS-driven. You can do it, absolutely, but it's a little easier with RIS/EMR." Avrin says the two most important considerations for any system are integration and interoperability. He adds that it's also crucial to link images from the reports in the EMR for the referring physicians, either with a URL or functionally equivalent method. Right now, he thinks the RIS/EMR model offers more advantages. "The current reality is that RIS/EMR integration works," Avrin says. "We need better tools and vendor agreement to make interoperability easy, but you can make a stronger case for the RIS/EMR argument than you can for RIS/PACS." That doesn't mean, however, that the RIS/EMR model is perfect. The reason RIS/PACS has been so popular is because they use a lot of the same data elements. The integration has been beneficial for radiology workflow. "Most of the information you need in a PACS database is already in the RIS database. The only additional big items you need are pointers to the image cache, to get the actual images, the ability to accept incoming images, and the acquisition parameters," Avrin says. "But there are a lot of similarities between the databases so the RIS/PACS integration was thought to be a good idea because RIS-driven workflow works a little bit better than PACS-driven workflow, and tighter integration between those systems was appealing." Kennedy says most RIS are not well integrated with EMRs. There also aren't many RIS/EMR choices. Epic and Cerner are the only large EMR vendors with RIS modules, and Epic holds the lion's share of the market. Although many, if not most, health care organizations are being driven by EMR integration, those that aren't may find RIS/PACS to be a preferable model. "You can make a very strong argument that, if you're not being driven by the EMR functionality, you would be better off with the PACS/RIS because the workflow integration between the PACS and the RIS is stronger than [integration with] the EMR," Kennedy says. "You can get really good data, the labs, prior history, all of those things, in the EMR but, in terms of integrating your imaging system with your RIS workflow, PACS/RIS is a stronger argument." There's also the issue of advanced visualization. The EMR viewer doesn't offer as many tools or the same level of visualization as the PACS viewer. For referrers who use advanced imaging, such as orthopedic surgeons, neurosurgeons, oncologists, and urologists, this can be problematic. "I think it's important to keep in mind that the way the EMR is distributing the images is not necessarily at the same level of diagnostic quality that we, as the radiologists, would need to do our interpretations," Cook says. "So, ideally, you would be able to distribute the imaging data in its original form or with lossless compression or something like that so that the referring provider is seeing what you're seeing because that is one of the complaints that we currently have in our environment. 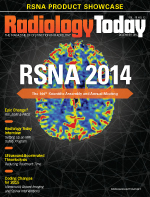 I think making imaging accessible, at radiological quality, is certainly valuable." Perhaps the biggest drawback of the Epic RIS/EMR, though, is that it's lacking in business logic, Avrin says. Although Radiant has an excellent database with the ability to build interfaces on top of it, it can't be easily replicated from one facility to the next. There's a significant amount of customization required for items such as order definitions and codes. Avrin believes this mitigates one of the chief advantages of software, which is to write it once and apply it to multiple users. The customization that's required also makes Radiant an expensive option. It should be noted, however, that there aren't a great deal of RIS/PACS options, either. Fujifilm's Synapse is currently the biggest player, with about one-half of the integrate RIS/PACS market, according to Kennedy. He sees the limited number of RIS/EMR or RIS/PACS options as an argument for modular components, but integrating multiple components from disparate vendors isn't easy to do. "You're still not able to do what, in theory, we should be able to do, which is the best of breed of each of those solutions, integrated together with open standards," Kennedy says. "And that's a great dream—it's just so hard to achieve that most people end up following the path of least resistance." That doesn't mean that best of breed isn't worth pursuing. Ultimately, the best configuration of EMR, RIS, and PACS depends on the organization's needs. Chang doesn't think the RIS/EMR vs RIS/PACS question adequately addresses the interoperability needs of health care; he likens it to the Apple vs Android "fanboy" arguments. He says health care organizations need to ask themselves what they want to achieve with integration, determine their functional requirements, and develop a strategy that works best for them. "When I hear the question, 'Do I believe in EMR/RIS-driven vs PACS-driven workflow?' it is like asking, 'Do I prefer my left arm vs my right foot to coordinate my actions?'" Chang says. "What I really want is my spinal cord and my brain to optimally orchestrate my arm and foot and everything else to achieve the desired goal." What's needed, says Chang, is a coordinator or coach to direct traffic. For example, although the University of Chicago has Radiant, it uses M*Modal's workflow engine to coordinate workflow with its EMR, RIS, PACS, speech recognition system, billing system, transport system, and scanners. He says neither the EMR nor the PACS was able to perform tasks such as improving the efficiency of technologist protocoling, automatically protocoling the machines without having the users do it, orchestrating workflow and transport, or identifying patients who are ready to be discharged the same day. Avrin says interoperability tools, such as Health Level Seven International's fast health care interoperability resources can enhance system integration; it is an international collaboration that is open-sourced, xml-based, and built on Health Level Seven International's clinical document architecture. Right now, though, there isn't great demand for interoperability tools. Avrin believes the radiology community needs to educate technology purchasers about the need for interoperability tools in the same way they educated people about the need for DICOM. "Radiologists, with help from IT, know best how to create a good radiology information system and, if you can create a good modular system, you should be able to make that system plug and play with the patient care system. You just can't do that easily, today," Avrin says. Another deficiency in current systems is a lack of collaboration tools. The ability to interact with referrers is a cornerstone of patient care. Cook says there's been a lot of emphasis on moving data in the health care system, but not enough on clinical interaction. She says she would like to see consultation tools added to vendor offerings. "I think, in the best case scenario, [we should] try to determine the technologies that make the images widely available, allowing the referring providers the opportunity to interact with the images, but also allowing radiologists, in a consultative environment, to interact with the providers, perhaps manipulating the data on one side [of the interface] so that the providers can see it on the other side, and actually have continuing consultation about patients," Cook says. Chang agrees. He says health care IT should take a cue from millennials when it comes to sharing data; they don't limit themselves to a single method, and they keep trying new ones. One of the tools that Chang would like to see is a clinical finding tool that alerts referrers when there's a finding that requires follow-up. He says less than 30% of radiology report recommendations are currently followed up. He would also like to see hyperlinks added to radiology reports, for decision support. Despite technological advances, referrers still receive a "flat" report, much like the ones that used to be faxed. Chang points out that, before PACS, there was plenty of communication. Radiologists didn't need the patient's history and referrers didn't need a report because they frequently talked face to face. He says people in health care IT need to wake up to the reality that moving data isn't good enough. "That's inadequate. That's not collaboration. What we want is true collaboration," he continues. "We're missing the boat, here. If we're going to demonstrate our value, don't get hung up on the integration fanboy wars. Do what you need to do locally and concentrate on providing real value to patient care." — David Yeager is a freelance writer and editor based in Royersford, Pennsylvania. He primarily writes about IT for Radiology Today.